Submitting a Template to the public Template Directory is a simple process that benefits all parties involved. We're proud to have Partners with unique and efficient reporting strategies, and we want to share that with the rest of the Databox community. To submit a Template, fill out this form with more information about your Databoard. We will review the Template, making sure it's both original and insightful, and will send you notice of its publication. All of the information that we gather when you submit a Template is used to paint a comprehensive picture of how to best use the Template. You can find more information on each field below. Name of Databoard: This should be a combination of the Data Source(s) and the category of Metrics monitored. For example, if you submit a Template that analyzes HubSpot Mktg Email Metrics, the name of the Template could be "HubSpot Mktg Email Performance" or "HubSpot Mktg Email Overview." If you leave out "HubSpot Mktg" from the title, you may not reach the right audience. If you leave out "Email" from the title, other users may not be able to quickly understand the focus of the Template. Company Name / Company URL: We believe in giving credit where credit is due, so all published Templates have an Author listed that will state your Agency name, logo, and an accompanying URL. We get about 2,000 signups to Databox every month, so this is a great way to get your name out there. Furthermore, we provide the opportunity for submitters to include a link to relevant articles that they have written on the subject. By including this link with your Template, you'll generate more traffic to your site and potentially start some conversations. Databoard: Make sure every Datablock on your Databoard has at least 2 Date Ranges in common. For example, every Datablock might have "Year to Date" and "Last 30 Days" as Date Range selections. Individual Datablocks can have their own Date Ranges, but there should be at least 2 Date Ranges in common between every Datablock on the Databoard. This allows for the use of the Master Date Switcher on the Databoard. Further, please be sure to set the Comparison Date Range to Previous Period on every Datablock that allows this functionality. Description: The Description should start with "This dashboard..." or "The (Template Name without Data Source) dashboard..." to ensure it reaches the right audience. This is for SEO purposes so that the word "dashboard" appears on the page. The remainder of the description should provide a high-level overview of the things that a User can accomplish with this template. 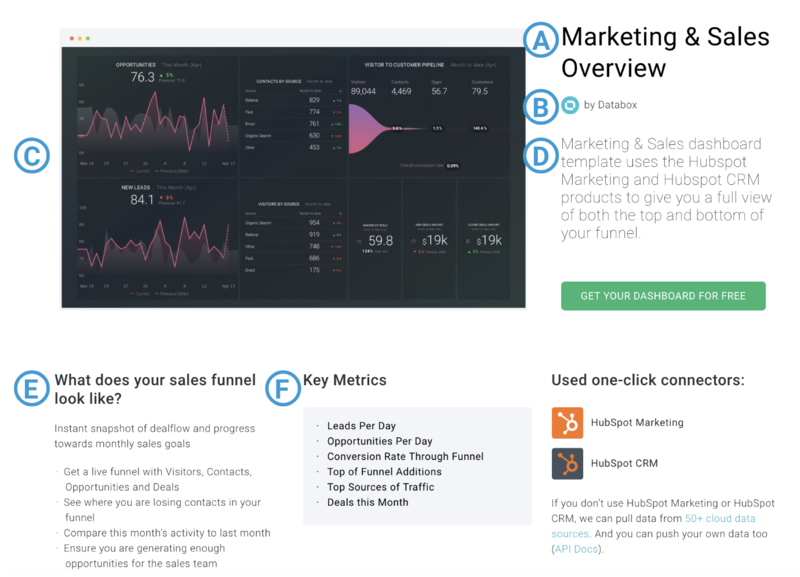 For example, if the Title of the Databoard is "HubSpot Mktg Email Performance", the description could start with "The Email Performance dashboard..."
Real-World Success: This section focuses on the value to the User. How will your Sales, Marketing, or other areas improve if you download this Template? What insights will you gain? This should be moderately technical, so feel free to include specific KPIs that could be influenced by this Template. Key Metrics: In this section, outline the precise Metrics on the Databoard, listed either left-to-right based on its position on the Databoard or in order of importance. This section is key for Users to skim the page and still understand what data is being accessed in the Template.